This large scale 4-day Summit takes place from 15 – 18 May 2019 at the Ticketpro Dome, Northriding Johannesburg. 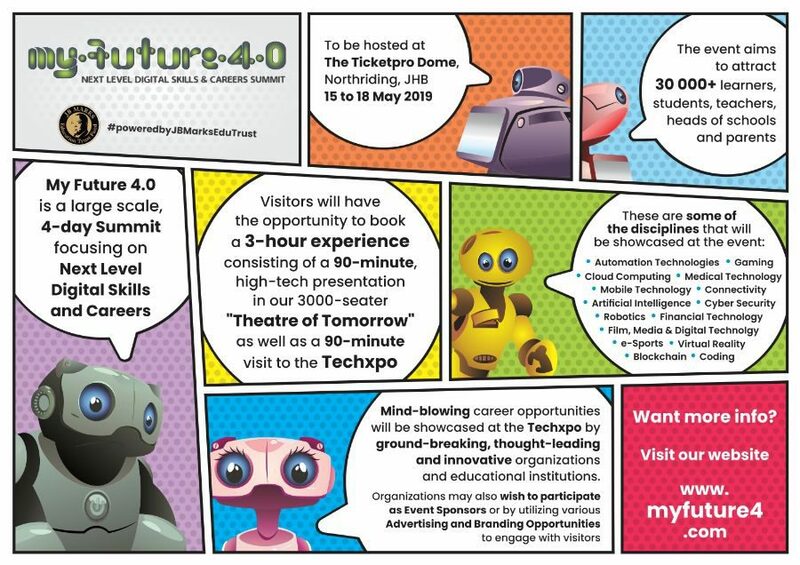 It focuses on “Next Level Digital Skills and Careers” and will enlighten, motivate and excite our visitors about the future of skills and careers in the new digital revolution; showcasing the innovations that will change the world of work. The event aims to attract 30,000 learners, students, teachers, heads of school, parents, post-graduates, as well as those already employable and seeking information on the skills required, and opportunities existing, within the Fourth Industrial Revolution. Don’t miss My Future 4.0! Together let’s inform, enlighten, empower and inspire our youth!